Eric Stroud is in the business of spoiling appetites. His clients include some of the most voracious creatures on the planet—the tiger shark, the reef shark and the southern stingray, to name a few. Stroud, a research chemist who heads the New Jersey-based company SharkDefense, develops chemicals, metals and magnets that drive off sharks. Scientists think these materials work by overloading sharks’ senses. The repellents may someday be used to protect us from sharks, but they’re better suited to protect sharks from us. Fishermen from Maine to South Carolina don’t intend to catch the spiny dogfish, but the small, bottom-feeding shark frequently gets swept up in trawling nets and caught in fishing lines. “It just wrecks everything,” says Glen Libby, president of the Midcoast Fishermen’s Cooperative in Maine. “Your fish look like they’ve been through a food processor,” especially after rubbing in the nets against the dogfish’s sandpaper-like skin. Dogfish aren't very profitable, either: something about the bladderless shark’s strong taste just doesn’t appeal to the American palate. There is a small market for those who sell the shark to the British, who use the torso for the fish in fish and chips. But most fishermen are interested in cod and flounder. “I think some sort of repellent would be helpful,” Libby says. Conservationists also want to keep dogfish from being caught. In the Northeast Atlantic, dogfish are critically endangered, meaning that stocks have decreased by at least 95 percent in the past 20 years. The cause of this population decline is unknown, but it’s likely a combination of accidental and intentional overfishing. The repellents Stroud is developing could aid dogfish, as well as the approximately 12 million sharks worldwide that are unintentionally caught as bycatch every year. Shark populations don’t recover quickly; the animals mature slowly and don’t have many offspring. Researchers have been experimenting with shark repellents since World War II. In the 1940s, the Navy experimented with 38 compounds to create a repellent that smelled like rotten shark, the one scent rumored to deter the predators. Their research yielded “Shark Chaser,” a cake-like mixture made of copper acetate that was standard issue in survival vests until the Vietnam War. The vests also included a black dye that could “hide” potential victims from a shark attack. Neither one worked. Future celebrity chef Julia Child cooked up another World War II-era experiment. The Office of Strategic Services, the predecessor of today's Central Intelligence Agency, assigned Child the task of creating a shark repellent that could be used to coat anti-submarine explosives, which the sharks were accidently detonating. This also proved fruitless. In the mid-1970s, University of Miami’s Samuel Gruber and a team of Israeli and Egyptian scientists experimented with a toxic chemical secreted by the Moses sole, a flounder-like fish native to the Red Sea. 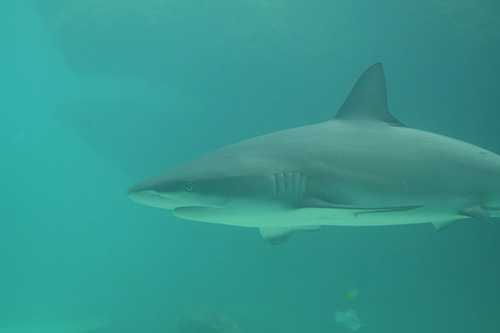 The toxin was found to quickly kill sharks, but only when injected directly into a shark’s mouth. An application for the toxin arose in the 1980s, when sharks were attacking listening devices being towed by Navy submarines to conduct spying missions against the Soviet Union. As soon as the sharks bit, the missions would end. It’s what Gruber calls “the million-dollar bite.” He spent years on the project but was never able to come up with an effective repellent. Magnets made from iron, boron and neodymium are another promising repellent being developed by SharkDefense. Eric Stroud discovered their repellent potential by accident. According to Stroud, he and colleague Michael Hermann were playing with magnets near a research tank containing lemon and nurse sharks. After spotting a broken pump, Stroud set a magnet down on the tank’s side, and the sharks took off. He thinks that the magnets may overload the sharks’ Ampullae of Lorenzini. These tiny pits found along a shark's head are used to detect faint electrical signals emitted by prey, in the same way a doctor uses an EKG to detect the electricity generated by your pumping heart. The magnets are unlikely to cause pain, says Richard Brill, a SharkDefense collaborator at the Virginia Institute of Marine Science. He and others hypothesize that it’s equivalent to a bright flash of light. You wince because it’s overloading the visual receptors in your eyes. “It’s the same idea with the sharks, except it’s overloading these electrical receptors, “ Brill says. Stroud has been using stationary magnets so far, but he also sees potential in spinning magnets, which generate a greater magnetic field. Stroud and his team are also working with electropositive metals, which produce a current when placed in seawater and also possibly affect sharks’ electromagnetic sense organs. Scientists are testing the metal repellents as a solution for the dogfish bycatch problem. Researchers found that the metals, when attached to fishing lines, reduced shark bycatch by 17 percent in Alaskan fisheries. But when the experiment was repeated in the Gulf of Maine, the results were negligible. “We think the dogfish are just going after two different preys,” says Stroud, who is completing a Ph.D. in chemistry at Seton Hall University. Rice speculates that the metals may not affect Northeast dogfish because the sharks are using smell more than their Ampullae of Lorenzini to detect prey. Undaunted, Stroud says, “no shark repellent is 100 percent—the name of our game is reduction.” He hopes that his company’s repellents can eventually help fishermen cut in half the number of sharks caught as bycatch, which would save more than 1,000 sharks a day. Even though results from the bycatch field tests aren't overwhelming, Stroud says their tests on sharks in the laboratory and in the field suggest that SharkDefense's strategies can work. This summer, the company began licensing its products through RepelSharks, LLC., which sells aerosol cans with chemical shark repellents as well magnetic anklets for humans. “We are the first to bring these products to the market,” Stroud says. “It doesn’t make sense to wait.” Patrick Rice imagines that the SharkDefense’s repellents could work in life vests and boats as well. The other big name in the industry, the Australia-based company SharkShield, sells electronic-wave repellents aimed at protecting people. There are 50 to 70 reported shark attacks on humans each year, according to the Florida Museum of Natural History. But for Stroud and his colleagues, it’s mostly about the sharks. “We want to create sustainable fisheries,” he says. “We want to change the way we fish.” The first step is finding the repellent that bites.